The Panama Jack Tiki Bar Collection features one of the best outdoor aluminum in tiki bars today. 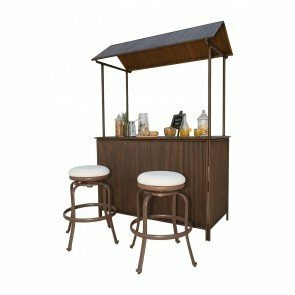 The swivel barstools have been finished in an espresso finish and the canopy tiki bar has powder-coated then hand finished with a brushed antique color. This 3 PC backless barstool set will give lots to talk about with your friends and family well enjoying timeless moments together. Cushions included as shown in a 100% polyester fabric or upgrade to Sunbrella fabric options to bring your own personal design to life.